Women under stress often notice their hair and nails often become lackluster and brittle. Biotin remedies this problem, kicking hair & nail growth into high gear and even skin glows again. But not just any Biotin pill gets results: the key to lush hair, eyelash, eyebrow, and nail growth is finding a high-absorption, bioavailable form of Biotin and then to take it daily. RejuvaBlend developed a way to sneak a daily dose of a high-absorption Biotin into…wait for it…a rich, smooth coffee. 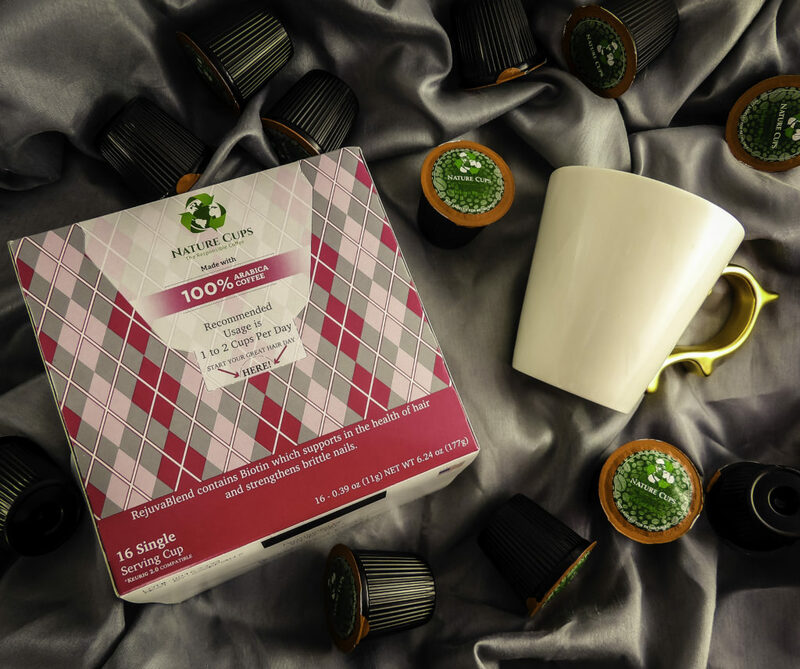 RejuvaBlend coffee is like pretty in a K-Cup. The only thing better than a quick beauty fix? A quick beauty fix included in your coffee. Like a magic beauty potion, RejuvaBlend coffee remedies a big beauty complaint of many busy women: stress taking a toll on their appearance. Burning the proverbial candle at both ends often leads to the depletion of the body’s reserves, leading to lackluster hair and nail growth. Biotin is a water-soluble B Vitamin (B7) which is associated with glowing skin, thicker, fuller, and longer hair and the growth of longer and stronger nails. Biotin also supports the health of the nerves, digestive tract, metabolism, and cells. Because it is water soluble, it should be taken daily. WHAT DOES BIOTIN DO FOR HAIR GROWTH? According to Dr. Richard K. Scher, Clinical Professor of Dermatology at Weill Cornell Medical College has spoken extensively about Biotin. Hair that is brittle, damaged, not growing or even experiencing hair loss can have many causes, and Biotin seems to have the ability to halt various types hair loss and encourage regrowth in most women, regardless of the reason behind the loss. 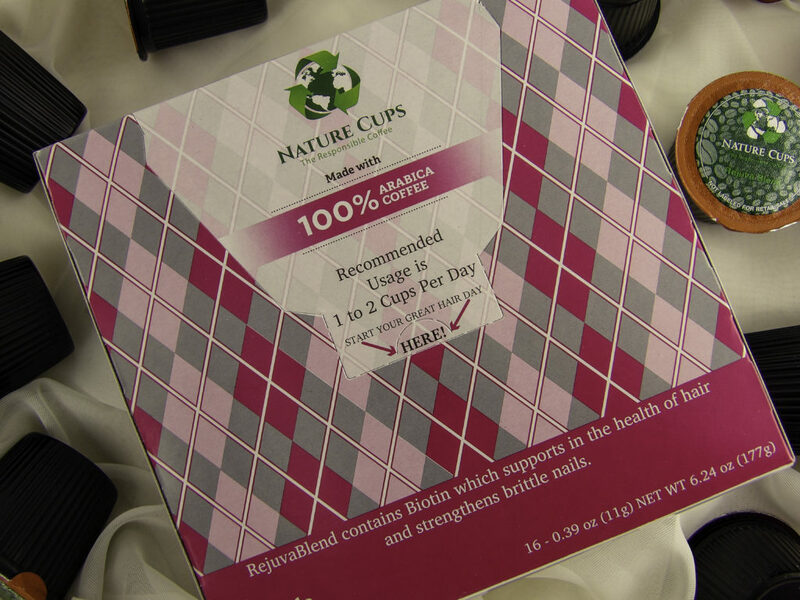 Whether hair loss is due to postpartum, stress or poor diet, a bioavailable Biotin can help. Want to regrow overly thinned out eyebrows? Biotin can help with that too. How Biotin works is unclear. Dr. Scher believes Biotin supports the building of the keratin structure of hair and nails. I thought that sounded promising since my hair looks so much better after a Keratin conditioning treatment. WHO CAN USE MORE BIOTIN? Almost everyone. Unlike some B-Vitamins, Biotin is considered safe even in larger doses. But a multi-vitamin and even many B-Complex supplements often do not contain even the minimum daily requirement of Biotin, much less the amount that enhances hair and nail growth. HOW MUCH BIOTIN IS NECESSARY FOR HAIR GROWTH? The daily recommended dosage of Biotin required to grow hair is at least 2.5 mg (or 2,500 mcg). Rejuvablend contains 2928mcg. I was surprised to see that my highly reputable brand and rather expensive daily multi-vitamin pill only contains 33% of the daily requirement of Biotin! After some research, I see my daily multivitamin is not the only one that does not supply as much Biotin as might benefit me. Even a well-known hair-growth vitamin contains only about 60% of the daily recommended dose of Biotin. Few people have a severe Biotin deficiency, but it can occur if you take antioxidant supplements such as Lipoic acid (AKA Alpha Lipoic Acid). If you consume lots of antioxidants in the form of white tea, green tea or as a supplement, these can all increase your need for biotin. Lipoic Acid, an antioxidant and anti-inflammatory supplement that is an anti-aging insider beauty secret, made famous by Yale celebrity dermatologist Dr. Nicholas Perricone within his beauty/health and anti-aging diet. Since Alpha Lipoic Acid is such as wonderful antioxidant and anti-inflammatory supplement, it makes sense to supplement with more Biotin than to cut back on beauty supplements like ALA.
Certain medications and medical conditions can impair or block the absorption of Biotin within your system. If you have such medical problems, a bioavailable Biotin such as found in Rejuvablend can be an excellent daily Biotin source. WHY BIOTIN IN YOUR COFFEE? EASY AND CONSISTENT: You likely drink coffee every day, so it not only makes it easier to get your Biotin, you will likely not miss a daily dose of Biotin. Consistency is key with Biotin: if you’re serious about growing your hair out, don’t skip doses. BETTER ABSORPTION: As a B Vitamin, Biotin has better absorption as a liquid that a pill or capsule. Liquid consumption of B Vitamins has twice the absorption rate of pill or capsule form vitamins. Rejuvablend has a proprietary delivery system that maximizes the absorption of Biotin into the body, making the most out of this beauty-making B. EASY TO SWALLOW: Many Biotin vitamin pills or hair growth vitamins are big, chalky and hard to swallow. 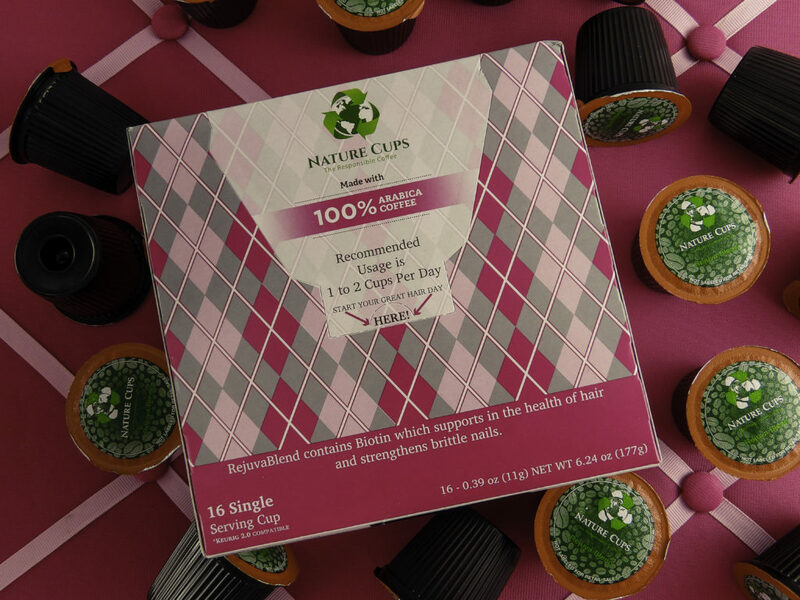 COST: Rejuvablend K-Cups are a comparable price or less expensive than standard K-Cups but with the bonus of a high-grade, proven effective, bioavailable Biotin. TASTE: Rejuvablend is Tasty! Made with 100% Arabica coffee. It is a medium-dark roast that is not bitter and has a caramel note. HOW MUCH BIOTIN IS TOO MUCH BIOTIN? While it’s hard to have too much Biotin, it is possible. The recommended usage is one to two cups of RejuvaBlend coffee which is enough Biotin to amp up both hair and nail growth, more than that is not necessary. 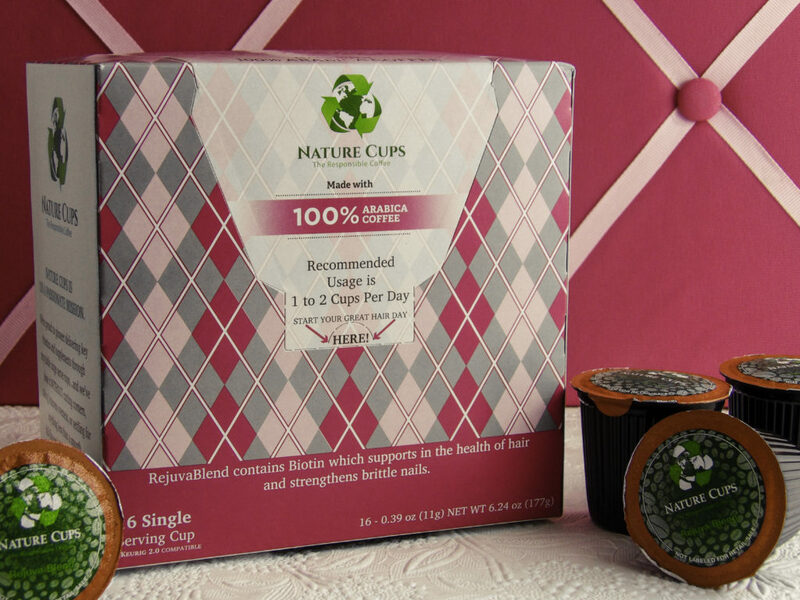 RejuvaBlend Nature Cups K-Cups are 100% recyclable and work with any Keurig Brewer machine, old or new. They come 16 K-Cups to a box. HOW DOES REJUVABLEND COFFEE TASTE? I like it! A smooth, dark, rich taste with no afterbite. There is a note of caramel but it is not too sweet. I found RejuvaBlend coffee to be tasty, smooth and delicious without an aftertaste; there is nothing medicinal tasting about this coffee! Hair, skin, and nails all respond well to Biotin, especially when taken with a balanced meal containing other B Vitamin rich foods like eggs, whole grain, cheese, and soy. Having my Biotin in my morning coffee with breakfast ensures that I get this water-soluble vitamin daily. Longer hair, fuller eyebrows, batworthy lashes, and healthy nails, here I come! 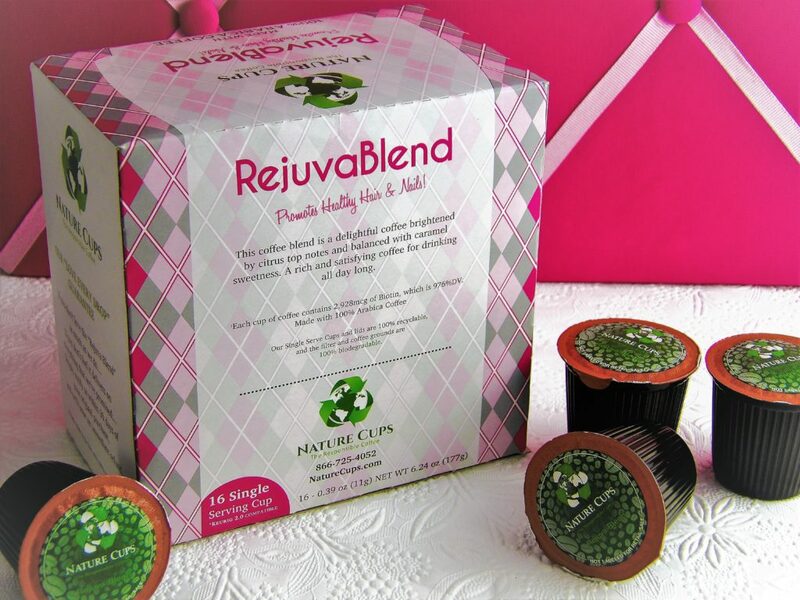 RejuvaBlend is like a pretty potion in your morning cuppa! 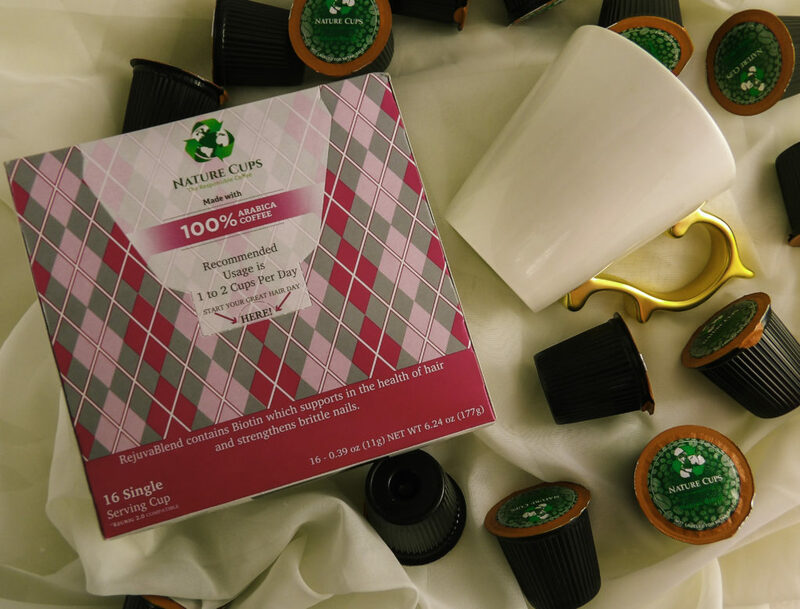 Style Chicks received Rejuvablend K-Cups with Biotin in exchange for our unbiased review and received compensation for our time and effort. However, our experience with the product and the opinions expressed in this review are 100% ours. Nothing makes your morning like a good cup of coffee or two. While I love a morning Starbucks run, I am often in a rush and don’t have the time to stop. For me, quality coffee equipment to make coffee beverages myself is a worthwhile investment. I have invested in a few espresso and coffee maker machines over the years. But nothing beats the kind of espresso my Grandmother would make for us in an old-fashioned Moka espresso maker directly on the stovetop. 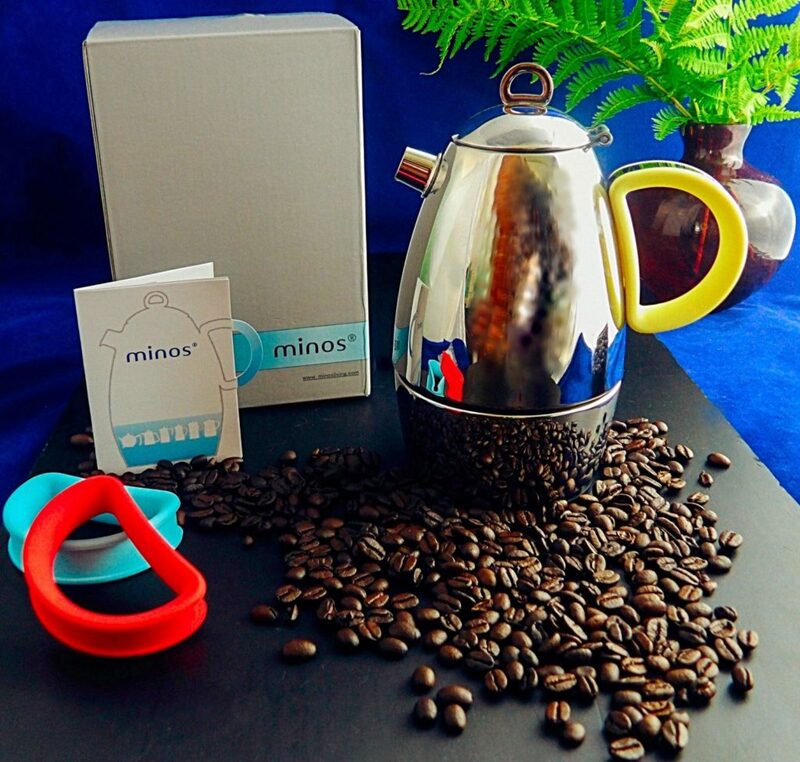 Minos has done it one better than what our Grandmother used in their Minos Moka Pot Espresso Maker It is a modern updated twist on a classic. The Minos Moka Pot Espresso Maker is a convenient way to get your morning (or afternoon) caffeine fix of artisan style espresso coffee. It makes up to six cups of espresso at once. In this case, a “cup” means espresso cup sized portions, or “shots,” not a full coffee mug sized “cup.” In total, it makes about nine to ten ounces total of espresso. If you are used to ordering your favorite Starbucks beverage with multiple shots of espresso, this Moka is a good size for one to two people, or enough to serve a traditional espresso with a twist of lemon after a meal. 1) It is Stainless Steel. This is important as the coffee oils build up over time and create a richer coffee taste. It is also important so that you get a long-lasting Moka pot. A sturdy one can last for years, my Grandmother’s Moka lasted since the 60’s. This Minos Moka Pot seems much sturdier to me. 2) It also has Stainless Steel and switchable, colorful Silicon Handle options. This is a cool, practical and innovative modern twist. 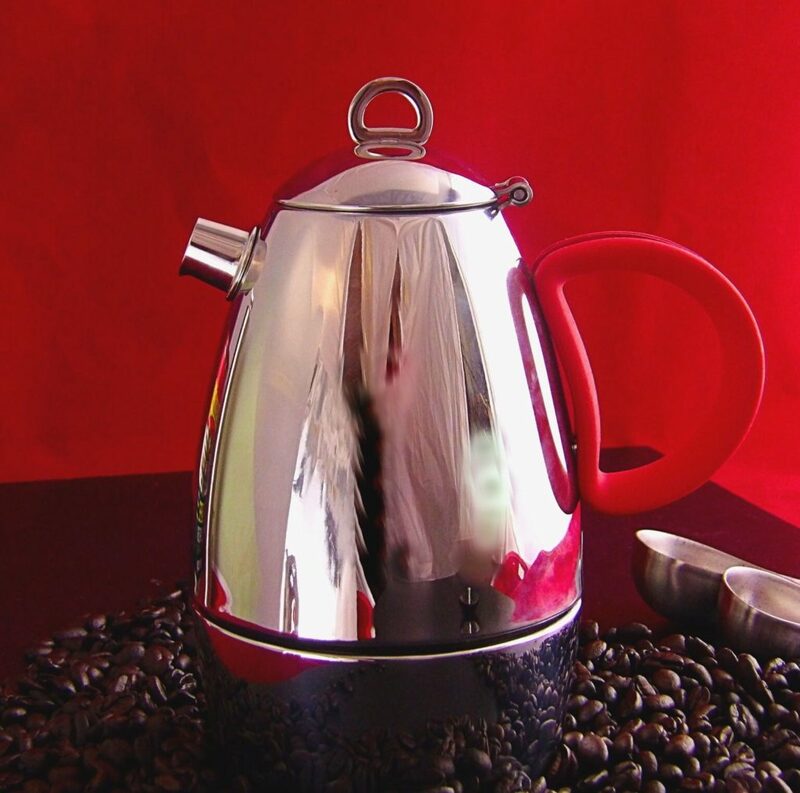 The reason for this option is because while Moka Pots last a long time, the handles are often the first to break or melt due to intense heat. The spare handles extend the life of your Moka pot if the handle starts to melt. They are also useful if you wish to color coordinate to match your kitchen or bar area. 2) Pour cold water into the bottom chamber. Fill up to one cm below the safety valve. This is roughly between 1/2 inch and .75 of an inch. When in doubt, fill with less water so that the safety valve is NOT submerged. 3) Grind fresh coffee beans to a medium to coarse grind. A fine grind will block the funnel. Alternatively, you can use pre-ground espresso. 5) Fill the funnel with ground coffee until it is full. 6) Using the tamper, flatten the grounds so that they are level with the top of the funnel. 7) Brush away any grounds that have spilled on the threads or funnel top. 8) Remove the tamper from the funnel. DO NOT LEAVE IN THE TAMPER DURING OPERATION. 9) Tightly screw on the top of the Moka pot. 10) Place Moka pot onto a heat source. 11) Keep the cover (the lid) open while brewing. 12) Turn off the heat once the coffee stops coming out of the tube. 13) Add espresso directly to your coffeehouse-style beverage or for a traditional espresso style drink, pour espresso into espresso cups and add a small curl of lemon peel. CONCLUSION: This is a high-quality Moka Pot made of sturdy stainless steel. It looks sleek and attractive. It is easy to clean and use, and best of all, it makes tasty artisan espresso that would make any Grandmother proud. A quality Moka pot like this one, with proper care, can last a lifetime and is an excellent investment for entertaining friends with a traditional post-dinner espresso or your own personal coffee needs. I am very happy to have gotten this Minos Moka pot for my daily coffee fix!